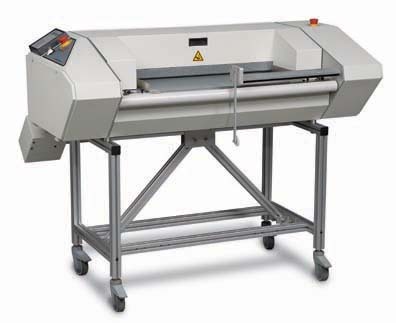 Ledco's Industrial Series 30" Finish Line High Speed Automatic Web Cutter Can Be Used With Most Any Roll Laminator and comes with Stand & casters and now has 2 year warranty. With a mechanical top speed of 150 feet per minute, this laminating film automatic cutter can keep up with almost all laminating machines. Put this behind your laminating machine to automatically make the horizontal cuts between your laminated sheets with borders or flush trimmed. Has integrated fiber optic sensor to activate the cutting blade as it senses the leading and trailing edges of each sheet and you can set border size or flush. Max web cutting width = 30"